, and still others by changing the frequency of their vocalization. Approximate frequency ranges of marine mammals soundsRichardson, W. J., Greene, J., Malme, C. I., & Thomson, D. H. (2013). 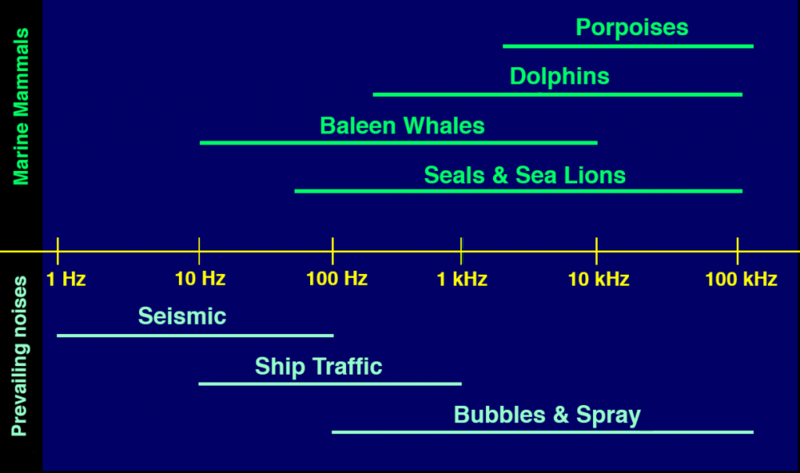 Marine Mammals and Noise. Burlington: Elsevier Science. and ambient noiseWenz, G. M. (1962). Acoustic ambient noise in the ocean: Spectra and sources. The Journal of the Acoustical Society of America, 34(12), 1936–1956. https://doi.org/10.1121/1.1909155. Masking is of particular concern to marine mammals when the noise is at frequencies that are similar to biologically important signals. Vocalization measurements in the field have shown also that animals change their behavior in response to increased background noise, just as you may speak more loudly to be heard in a noisy environment. Other behavioral changes may include increasing the number or length of calls or shifting the frequency of the calls. Blue whales were shown to call more often when a seismic device (sparker) was operatingDi Iorio, L., & Clark, C. W. (2010). Exposure to seismic survey alters blue whale acoustic communication. Biology Letters, 6(1), 51–54. https://doi.org/10.1098/rsbl.2009.0651. 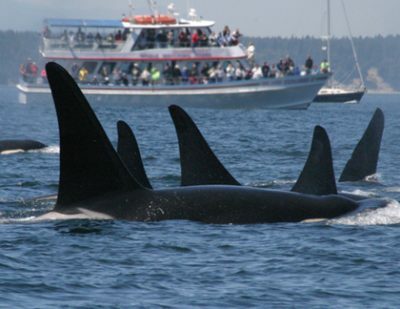 A long-term study of three social groups (pods) of killer whales found that once boat noise became sufficiently loud to mask their normal vocalizations, killer whales increased their call durationDi Iorio, L., & Clark, C. W. (2010). Exposure to seismic survey alters blue whale acoustic communication. Biology Letters, 6(1), 51–54. https://doi.org/10.1098/rsbl.2009.0651. Image credit: NOAA, NWFSC. In another example, the effects of noise on the vocal behavior of beluga whales in the St. Lawrence River Estuary have been studied. This region is both a main route for commercial shipping and a popular location for whale watching. Beluga whales live in the region year-round. When exposed to noise from a small motorboat and from a ferry, belugas reduced their calling rate as the boats were approaching, but then increased the repetition of certain calls when boats came within 1 kilometerLesage, V., Barrette, C., Kingsley, M. C. S., & Sjare, B. (1999). The effect of vessel noise on the vocal behavior of belugas in the St. Lawrence River Estuary, Canada. Marine Mammal Science, 15(1), 65–84. https://doi.org/10.1111/j.1748-7692.1999.tb00782.x. Beluga whales also changed the type of vocalizations and shifted to higher frequencies, perhaps in an attempt to minimize masking. Another study showed that beluga whales vocalized more loudly when exposed to higher noise levels, a reaction called the Lombard EffectFletcher, H., & Munson, W. A. (1937). Relation between loudness and masking. The Journal of the Acoustical Society of America, 9(1), 78–78. https://doi.org/10.1121/1.1902030. There is a limit to the Lombard response when the noise completely overwhelms the animal’s vocalizations. More research is needed to determine the noise levels at which the Lombard response begins and when the beluga vocalizations are completely maskedScheifele, P. M., Andrew, S., Cooper, R. A., Darre, M., Musiek, F. E., & Max, L. (2005). Indication of a Lombard vocal response in the St. Lawrence River beluga. The Journal of the Acoustical Society of America, 117(3), 1486–1492. https://doi.org/10.1121/1.1835508. Researchers have also shown that North Atlantic right whales increase the amplitude of vocalizations as a short-term response to moderate noise levelsParks, S. E., Johnson, M., Nowacek, D., & Tyack, P. L. (2011). Individual right whales call louder in increased environmental noise. Biology Letters, 7(1), 33–35. https://doi.org/10.1098/rsbl.2010.0451, whereas frequency changes in stereotypical up calls over several decades may be long-term responses to increases in ambient noiseParks, S. E., Clark, C. W., & Tyack, P. L. (2007). Short- and long-term changes in right whale calling behavior: The potential effects of noise on acoustic communication. The Journal of the Acoustical Society of America, 122(6), 3725–3731. https://doi.org/10.1121/1.2799904. There are still many uncertainties regarding how masking affects marine mammalsNational Research Council (U.S.) (Ed.). (2003). Ocean noise and marine mammals. Washington, D.C: National Academies Press.. For example, the potential impacts that masking may have on individual survival or the energetic costs of changing behavior to reduce masking are poorly understood. A relatively recent concept is underwater communication space, which refers to the area over which one individual can detect the signal of another. One paper has suggested a pure signal processing approach that compares signal-to-noise (SNR) ratios of whale vocalizations to background noiseClark, C., Ellison, W., Southall, B., Hatch, L., Van Parijs, S., Frankel, A., & Ponirakis, D. (2009). Acoustic masking in marine ecosystems: intuitions, analysis, and implication. Marine Ecology Progress Series, 395, 201–222. https://doi.org/10.3354/meps08402. Their algorithm has three factors: (1) spatial – the area over which ambient noise could mask a communication sound; (2) spectral – the frequency band of the communication sounds produced by the species of interest; and (3) temporal – the time duration over which background noise could compete with vocalizations. Using recordings from merchant vessels on Stellwagen Bank National Marine Sanctuary, off the U.S. east coast, in 2007, their analysis showed that ship noise from one vessel had the potential to reduce the area over which fin whale, humpback whale, and North Atlantic right whale vocalizations could be detected by 20%, 8%, and 77%, respectively. This approach is theoretical and does not consider threshold or attention mechanisms that influence actual animal response. Because of the widespread nature of anthropogenic activities, masking may be one of the most extensive and significant effects on the acoustic communication of marine organisms today. 3. ↑ Richardson, W. J., Greene, J., Malme, C. I., & Thomson, D. H. (2013). Marine Mammals and Noise. Burlington: Elsevier Science. 14. ↑ National Research Council (U.S.) (Ed.). (2003). Ocean noise and marine mammals. Washington, D.C: National Academies Press.